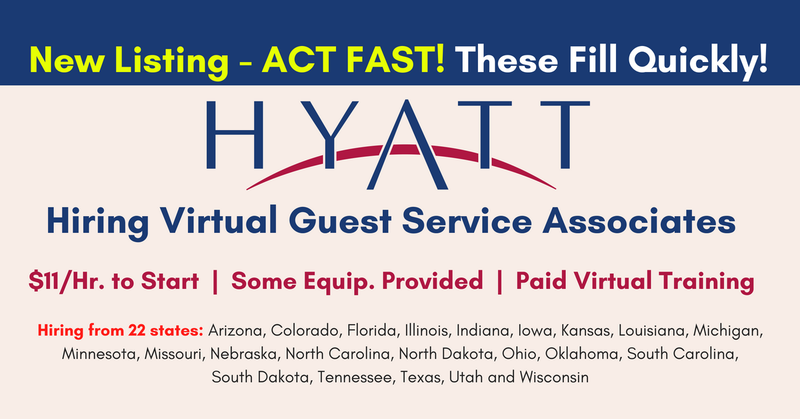 Hyatt just announced hiring for their next virtual training class for f/t Guest Service Associates. Paid virtual training begins Nov. 7. Quite a few RRRebels have been hired by Hyatt. ‎Norbie Ann Arias, for example, posted to our FB page yesterday, “I’ve just been hired by Hyatt. Thank you for the lead!” Ranz Burke was also hired, as well as Judith D., and April Lynne Reynolds. Starting pay is $11/hour and there are performance-based increases at set intervals throughout the year. Equipment provided: Hyatt provides a computer, IP phone and amplifier, adapter for dual monitors and a headset. Begin your new career at Hyatt. Earn $11.00 per hour. Watch your wage grow with performance based increases at set intervals throughout the year. Click here for more details and to apply. Hyatt employee reviews give it 3.9 stars out of 5 on Glassdoor and 4.1 on Indeed. For more jobs like these, check our Newest Jobs & Gigs page. To be the first to hear about jobs like these, like our Facebook page. Good luck in your next steps toward working from home! This entry was posted in Customer Service Jobs, Hiring Companies, Work at Home Jobs and tagged Hyatt. Bookmark the permalink.